The Royal Palace of Madrid (Spanish: Palacio Real de Madrid) is the official residence of the Spanish Royal Family at the city of Madrid, but is only used for state ceremonies. King Felipe VI and the Royal Family do not reside in the palace, choosing instead the more modest Palacio de la Zarzuela on the outskirts of Madrid. The palace is owned by the Spanish State and administered by the Patrimonio Nacional, a public agency of the Ministry of the Presidency. :7 The palace is located on Calle de Bailén (Bailén Street), in the Western part of downtown Madrid, East of the Manzanares River, and is accessible from the Ópera metro station. Several rooms in the palace are regularly open to the public except during state functions. An admission fee of €11 is required. The palace is located on the site of a 9th-century Alcázar ("Muslim-era fortress"), near the town of Magerit, constructed as an outpost by Muhammad I of Córdoba:7 and inherited after 1036 by the independent Moorish Taifa of Toledo. After Madrid fell to Alfonso VI of Castile in 1083, the edifice was only rarely used by the kings of Castile. In 1329, King Alfonso XI of Castile convened the cortes of Madrid for the first time. Philip II moved his court to Madrid in 1561. The old Alcázar was built on the location in the 16th century. It burned 24 December 1734 and King Philip V ordered a new palace built on the same site. Construction spanned the years 1738 to 1755 and followed a Berniniesque design by Filippo Juvarra and Giovanni Battista Sacchetti in cooperation with Ventura Rodríguez, Francesco Sabatini, and Martín Sarmiento. Charles III first occupied the new palace in 1764. View of part of the Royal Palace from Cuesta de la Vega, by Fernando Brambila (c. 1790-1832). Preserved in the collection of the Ministry of Economy and Finance. Filippo Juvarra oversaw work on the new palace. The Italian architect devised a lavish project of enormous proportions inspired by Bernini's plans for Versailles. This plan was not realized due to Juvarra's untimely death in March 1736.:8 His disciple, Giambattista Sacchetti also known as Juan Bautista Sacchetti or Giovanni Battista Sacchetti, was chosen to continue the work of his mentor. He designed the structure around a large square courtyard and resolved the sightline problems by creating projecting wings. In 1760, Charles III called upon Sicilian Francesco Sabatini,:9 a Neoclassical architect to enlarge the building. The original idea was to frame the Plaza de la Armería with a series of galleries and arcades which would accommodate the various dependencies and the construction of two wings around the same square. Only the extension of the southeast tower known as la de San Gil was completed. Sabatini also planned to extend the north side with a large facade that echoed the style of the building and included three square courtyards in size somewhat smaller than the large central courtyard. Work on this expansion started quickly but was soon interrupted, leaving the foundations buried under a platform on which the royal stables were later built. These were demolished in the 20th century and replaced by the Sabatini Gardens. Charles III first occupied the palace in 1764. One of the entrances to the Palace. Detail of the facade over the Prince's Gate. Reccared II and Liuva II, Visigoth kings, flanking the arms of Spain. The statues do not match the names on the bases. View of Paseo Principal, part of Campo del Moro Gardens. View from the Sabatini Gardens. The Republican government under Franco constructed the gardens to return the area from control of the royal family to the people, the public was not allowed in the gardens until 1978 when they were opened by King Juan Carlos I. The Archives of the Royal Palace contains approximately twenty thousand articles ranging from the Disastrous decade (1823-1833) to the proclamation of the Second Spanish Republic in 1931. In addition, it holds some scores of musicians of the Royal Chapel, privileges of various kings, the founding order of the Royal Monastery of San Lorenzo de El Escorial, the testament of Philip II and correspondence of most of the kings of the House of Bourbon. The wedding banquet of Prince Felipe and Letizia Ortiz took place on 22 May 2004 in the central courtyard of the Palace. ↑ "Palacio Real". Cyberspain.com. Retrieved 2012-11-30. ↑ Yahoo! Inc. (2004). "What is the biggest palace in Europe?". Yahoo! Inc. Retrieved 2011-07-29. ↑ Fernando Brambalia. "View of part of the Royal Palace taken from la Cuesta de la Vega". Spain Ministry of Economy and Public Administrations. Retrieved 2012-11-28. ↑ Autonomous University of Madrid (6 May 2003). "Calle del Arenal 13". Madrid Histórico. Madridhistorico.com. Retrieved 2012-11-30. ↑ "Catedral de Santa María la Real de la Almudena". GoMadrid.com. Retrieved 2012-11-30. ↑ "Plaza de Oriente". GoMadrid.com. Retrieved 2012-11-30. ↑ "Plaza de Oriente, Madrid". Madrid-Tourist.com. Retrieved 2012-11-30. ↑ Slavito (5 February 2008). "Sabatini Gardens: Chilling With the Kings". Sitebits.com. Retrieved 2012-11-30. 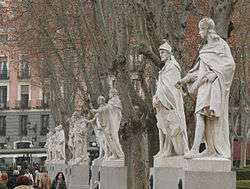 ↑ "Jardines de Sabatini". Madrid-Tourist.com. Retrieved 2012-11-30. Wikimedia Commons has media related to Royal Palace of Madrid.